Schizophrenia is not the same as a dual identify disorder (or multiple personality disorder). However, I like the word, so that's why I threw it in there. The Samsung ATIV Q will make you feel like you have two devices built-into one. It runs both Windows 8 or Android. So, if you love certain Android apps, you can run them on this large device. 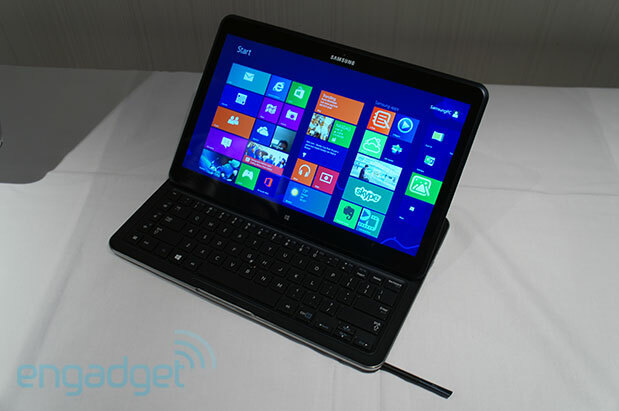 The ATIV Q uses an interesting hinge to convert the device from a slate tablet to a laptop. Will this type of hinge design catch on and gain popularity in the convertible tablet PC space? The Acer Aspire R7 uses a similar hinge design. With this design, you sacrifice the space you'd normally have to rest your wrists and for a trackpad pointer. The ATIV Q is a 13.3" device that comes with a keyboard with a built-in mouse pointer. The device also houses the Samsung S Pen, an active digitizer stylus pen. It also has a screen resolution that is much higher that what you will normally find in 13.3" ultrabooks. The 3,200 x 1,800 screen on the ATIV Q has a higher resolution than the 2,560-by-1,600 Retina Display found on the 13.3" MacBook Pro. Do you really need that much resolution? Maybe you do if you're a radiologist. Then again, this device is not an FDA-approved "medical device" that can be used for diagnostic purposes, but maybe radiologists will be eager to see how CT scans, X-rays, MRIs, and ultrasound images appear on the ATIV Q. Since it's powered by the new Intel 4th Gen Core processor (Haswell), the device is very fast and has robust battery life. Samsung rates it for 9 hours. The big question now is, what's it going to cost?